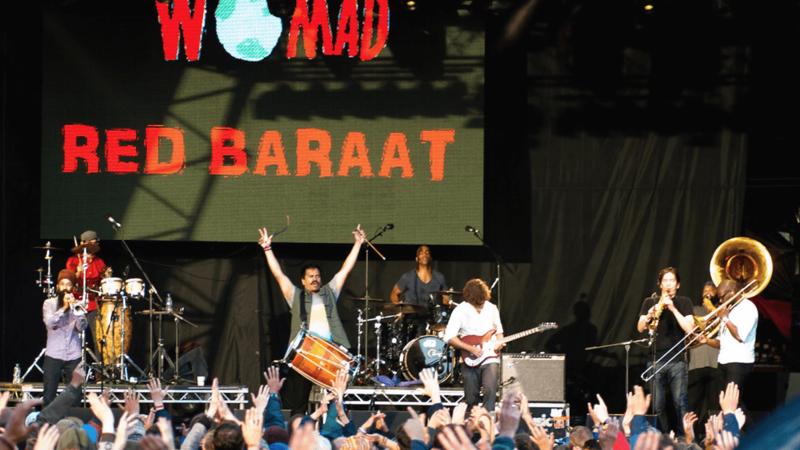 Last weekend Asian Arts Agency brought Red Baraat all the way from the USA for a fun-packed few days at WOMAD Festival. The Brooklyn dhol ‘n’ brass ensemble braved the soggy weather and played the Big Red Tent on Saturday, the BBC Radio 3 stage for Cerys Matthews and Lopa Kothari (which was broadcast live on BBC6 Music), and gave “the workshop of the festival” in the World Rhythms tent before storming the main stage on Sunday evening. The crowd couldn’t get enough of their boisterous, party-starting beats and the band added to the fun by inviting some very enthusiastic dancers from the audience up on stage with them. The event was a huge success for both Red Baraat and Asian Arts Agency. Stay tuned for more exciting festival events coming over the summer and autumn!